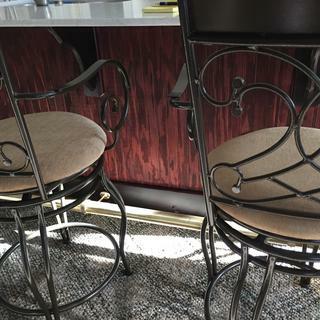 This brushed brass bar foot rail tubing will give your bar a vintage look while adding comfort for your guests. Add a bar foot railing to your setup with this brushed satin brass tubing. This vintage brass bar foot rail is available in a variety of tube sizes from 2-feet through 8-feet to fit the size of your bar. With its classic brushed brass finish, this bar rail tubing is made to add long-lasting, old-school style to any home or commercial bar. 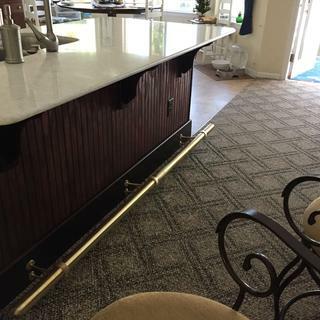 By using this brass foot rail tubing with matching components, completing a DIY bar foot rail project is easier than it sounds. Achieve a consistent look throughout your bar, with added comfort for your guests. Great looking. 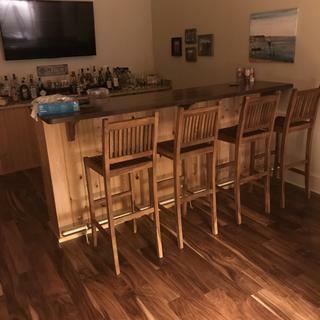 Finished off the bar. Parts are good. Delivery was much later than promised. Thank you for your feedback. Our apologies for the long wait period as we were waiting for the tubing you ordered to arrive back in stock. We're happy to hear that you were pleased with the quality of our bar rail and we hope your install went smoothly. Cheers! do you make 6' bar railings? We do not currently sell 6' bar rail tubing. For a rail that length, we recommend you purchase our 8' rail and cut it down to the exact size you need using a hacksaw. can this bar rail be bent to fit a radius bar? BEST ANSWER: Thanks for your question! Custom bends are made to order. We do it all in-house so turnaround is very fast. Please contact our bar rail sales team at 866-249-2337 or email barrails@kegworks.com to get the process started. I don't think this a product that could be bent by the customer. If you check the Kegworksd website, if you provide a detailed drawing of your needs, they can bend the piece(s) where you need. The satin bar rail is beautiful. Does this product tarnish or rust? We're looking for a maintenance free product to replace our current tarnished polished brass rails. 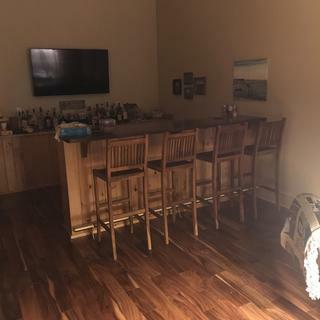 We have had the bar rail for about a year now and have not seen any indication of rust or discoloration. We are very happy with the product. I'm sorry but we do not offer a tee fitting in the brushed brass finish. Below is a link to our current selection of tee fittings. If you're open to a mixed finish look, we've had customers who mix brushed brass and brushed stainless for a really unique look. Cheers! Ok thanks for the info and i will check with my customer! After speaking with our bar rail experts, they also suggested that you could use a brillo pad on the polished brass tee fitting to get a brushed look. It doesn't end up with the exact same look but if you're not looking closely for it they say you shouldn't really notice the difference. It sounds like a really cool project. Good luck! BEST ANSWER: I'm not sure of the exact gauge but I can say it's pretty heavy wall tubing. We're very happy with it.